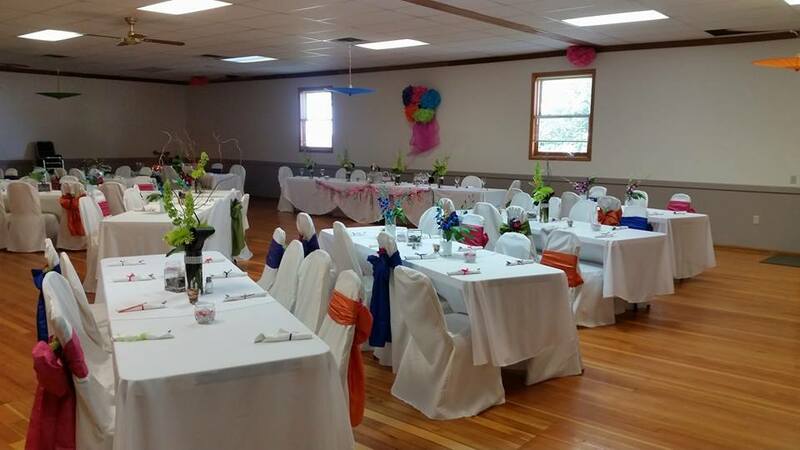 Rent Homesteader Hall for Your Next Event! Homesteader Hall is managed by the Huntley Project Lions & Lioness Club. 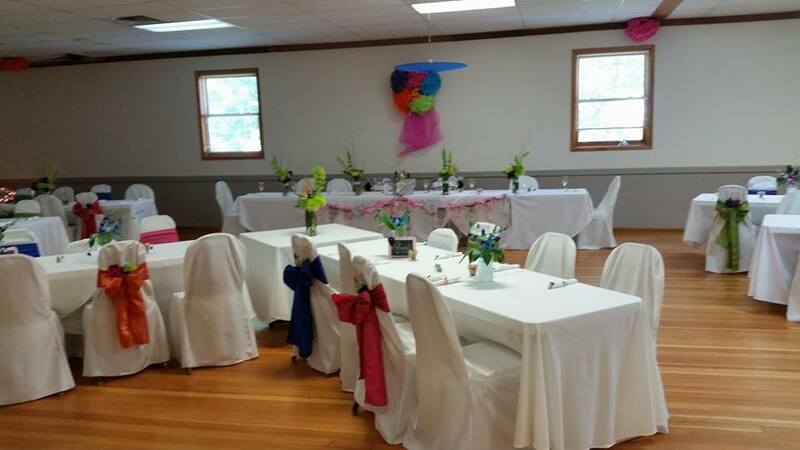 Homesteader Hall is available to rent and/or lease for special occasions, including weddings, family reunions, group activities, and meetings. 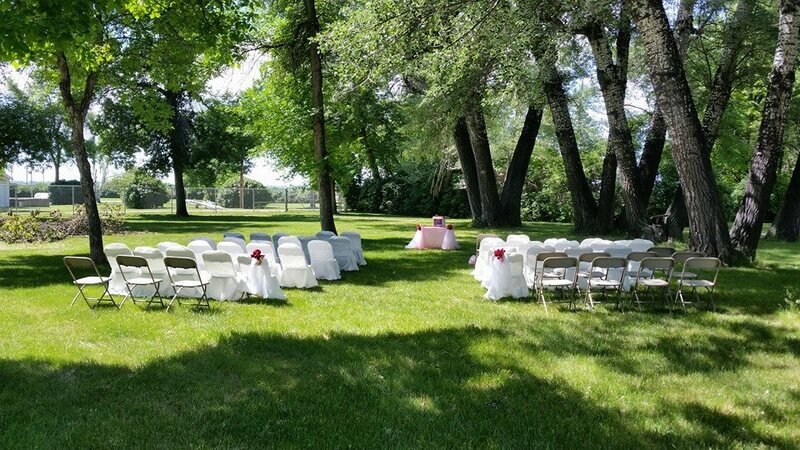 Homesteader Hall is located in Homesteader Park, which contains many shade trees for outdoor events, and provides a cozy and relaxing atmosphere for all occasions. Whether you would like to rent it for the whole day or a couple of hours, this location is a great place to get out in the country! See below for answers to the most frequently asked questions. Where is Homesteader Hall located? 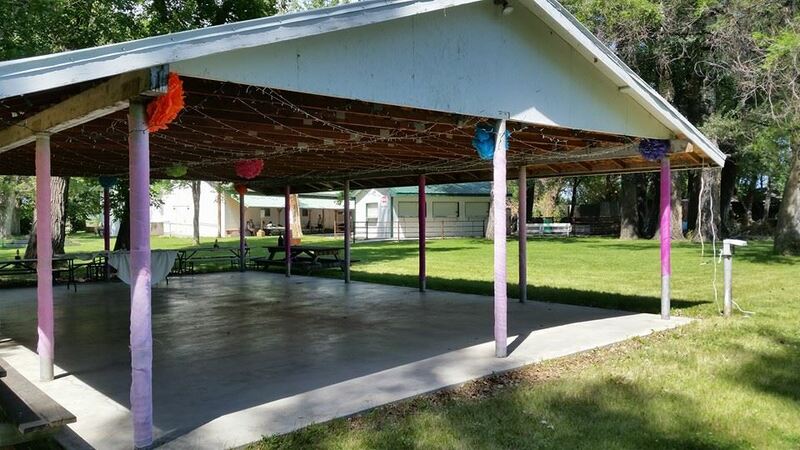 Homesteader Hall is located in Homesteader Park at 748 Railroad Highway in Huntley, MT. Take Highway 312 East from the Roundup Highway for 12 miles. Homesteader Park is on the right, just across the railroad tracks, beside the Southern Agricultural Research Center. The Hall can hold up to 150 people. Who do I contact to rent the hall? For more information, contact Evelyn Powell at 406-967-6575. What kind of facilities will I have access to? Bathrooms, kitchen, banquet hall, and the outside grounds (the space inside the chain link fence) are available for renter’s use. Can I decorate the night before? Yes, you can decorate the evening before the event (after 5 pm the evening before). See the next item for more information about rental costs. 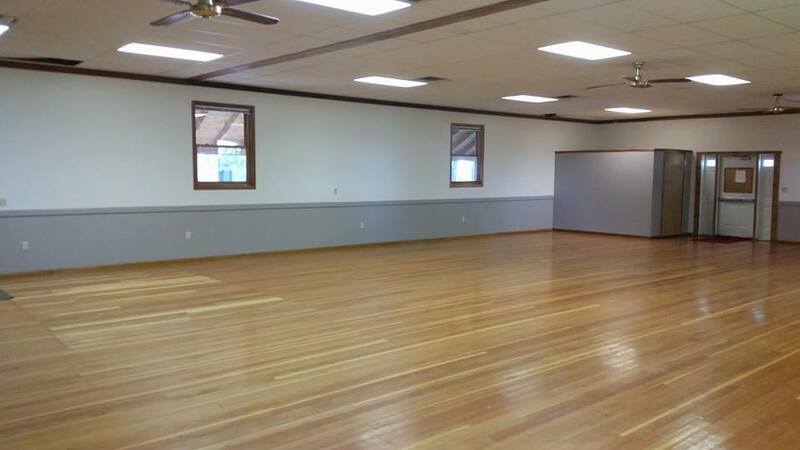 How much to rent the hall and park for a party or reception? Includes access to the hall and grounds, including kitchen. Deposit required equal to 1/2 rental rate. Special rates for clubs or organization who participate in or volunteer for Homesteader Days. $75/hour with a 2-hour minimum, capped at $500/day. $700 (Saturday or Sunday 6am thru 12am). $900 (5pm Friday thru 12am Saturday) or (5pm Saturday thru 12pm Sunday). $1100 (5pm Friday thru 12pm on Sunday). Add additional hours to Friday or Sunday at $50/hour. Flat fee of $100. Call to check availability. How much to rent it for a meeting? Includes hall and grounds. Kitchen NOT included. Monday thru Thursday. You are responsible for cleaning up after yourself. If cleaning is required, renter will be billed a $60 cleaning fee. $50/hour – 2 hour minimum. $25 per hour – 2 hour minimum. How much to rent the outside park only? Grounds only/No access to Hall. Park is free and open to the public if no one has the park reserved. Rental availability Sunday 12pm – Thursday 10 pm. You are responsible for cleaning up after yourselves. 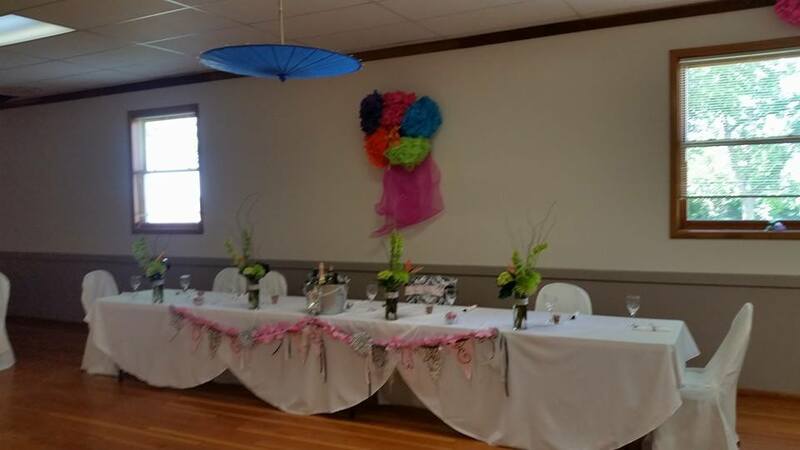 $100 to rent grounds and covered pavilion, with a $50 deposit required to hold on calendar. 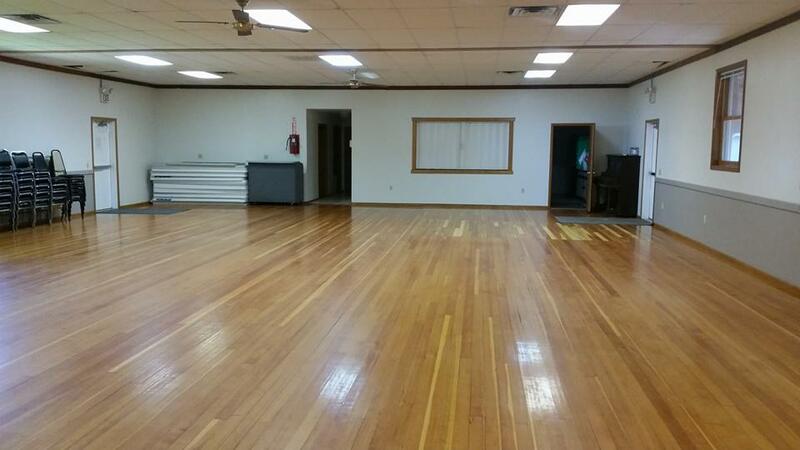 Are chairs and tables provided? Yes, both tables and chairs are provided with rental. Renters have access to 19 tables (8 foot) and 120 stacking chairs. Chairs and tables must be left in the building. Can we stage the event outside? Yes, an event can take place on the outside grounds inside the chain link fence. Who handles decoration and clean-up? Decorations and clean-up are handled by the renter. If the Hall is rented on a Saturday, the grounds and hall need to be cleaned and the key delivered back to Evelyn by noon on Sunday. Is there a stage for the band? There is no stage for a band inside the hall; however, there is a stage on the outside grounds.